Despite the fact that the official Way begins on the climb to the castle of Monterrei, many pilgrims, especially cyclists-, avoid this stage of the route and begin instead on the N-525, others, in addition look for a third alternative and from Verín, connect to the variant that comes from the north via the road that leads to Laza. The official route, however, follows in the footsteps of the old original Camino. Travelling upwards to the fortified city and, after a descent, leads to Albarellos. Throughout the day the journey involves too much time on asphalt, although, it also includes sections on paths of unquestionable beauty. The journey is easy in the first kilometres but becomes complicated on the climb to the peak of As Estivadas, of great difficulty. Another disadvantage of this day are the confusing signs on the route that are likely to pose problems for pilgrims at certain junctions. The journey begins in the albergue of Verín. 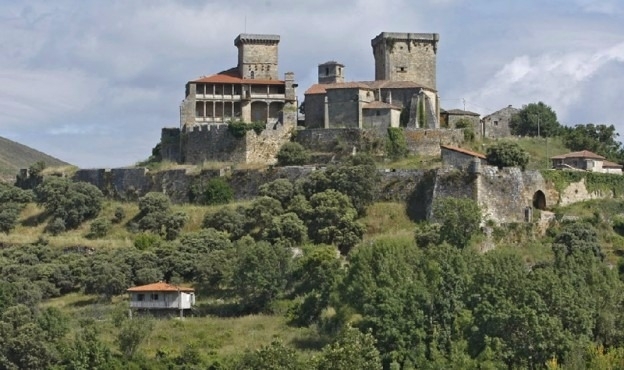 From here pilgrims have three options: continue by road, on the N-525, until reaching Albarellos; connect to the variant that proceeds through the north in the direction of Laza, on the OU-0121; or continue to the nearby castle of Monterrei. The route - still without signs –runs through the enclave and descends, immediately afterwards, in the direction of A Pousa. From here walkers continue on descent and pass a cemetery. At a fork in the Camino two milestones give directions to follow the route. All those walkers wishing to head in the direction of Trasmirás – Xinzo have to continue to the left. In this case 186,188 kilometres remain to reach Santiago. Those pilgrims who, on the other hand, want to continue to the northern route of the silver way must continue to the right in the direction of Laza (178,198 kilometres remain to Compostela). If taking the route to the left, badly signposted, on arriving at a new junction, pilgrims should take the Camino on the right. At the milestone 182,434 hikers should turn left. With Albarellos now in sight the river of the same name is crossed. Walkers will find some shops and a chemist. After passing below the N-525 the Camino heads to the left and later left again towards Infesta. The difficult climb to As Estivadas Walkers begin a journey through this small urban enclave, from which the difficult climb to As Estivadas also begins. After passing a modern recreational area, with outdoor picnic tables and a fountain, they will reach the street rúa da Fonte, this road leads to a fountain, with water but without health guarantees, and the point at which the ascent begins. At the junction with the N-525 hikers should turn right. They will reach Rebordondo and crown Pena Verde to arrive at the OU-1019, next to the milestone 171,567. The road is taken to the left to cross over the motorway. From here walkers continue ahead until reaching a sign that directs the Camino to the right. After ascents and descents on earthy paths with trees, hikers will turn first to the left and later to the right. 1.5 kilometres still remain to reach the albergue, situated in the centre of Vila de Rei. Cyclists have found their own route to cover this stage. Meanwhile pilgrims on foot are the only ones to travel on the original Camino (and not all do), those travelling by bike continue, from Verín on the N-525 until the end of the stage. 1 reviews Distance to Santiago: 180 km. 1 reviews Distance to Santiago: 151 km.